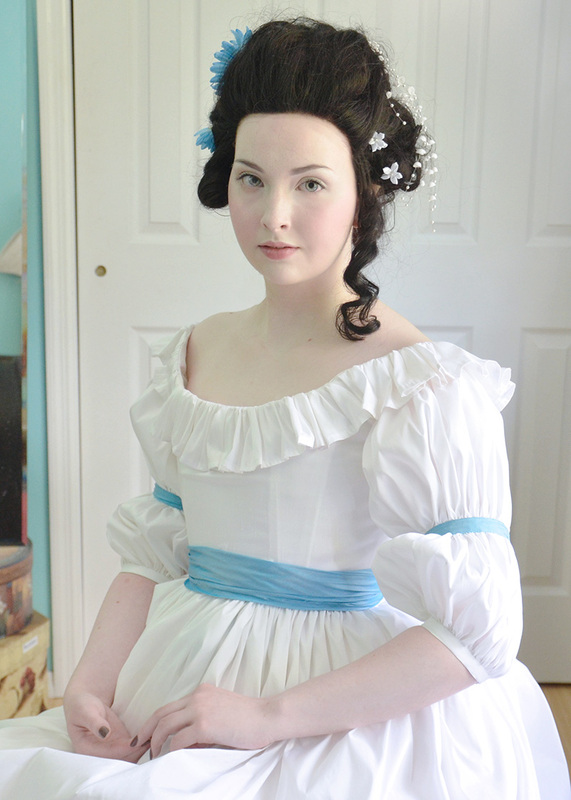 The adventure of making a horribly inaccurate chemise a la reine continues! 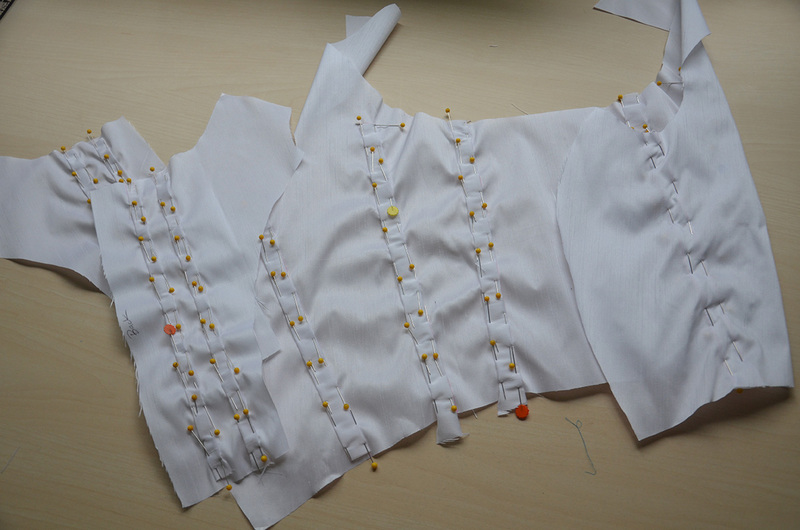 Part one shows the process of making the sleeves and skirt and can be read here. Step one was making a pattern. I actually used the pattern for my “Glittery Gothic” dress as a base, then added seams and changed the neckline. I made a mock up of this before finalizing the pattern but still ended up running into problems with the fit. 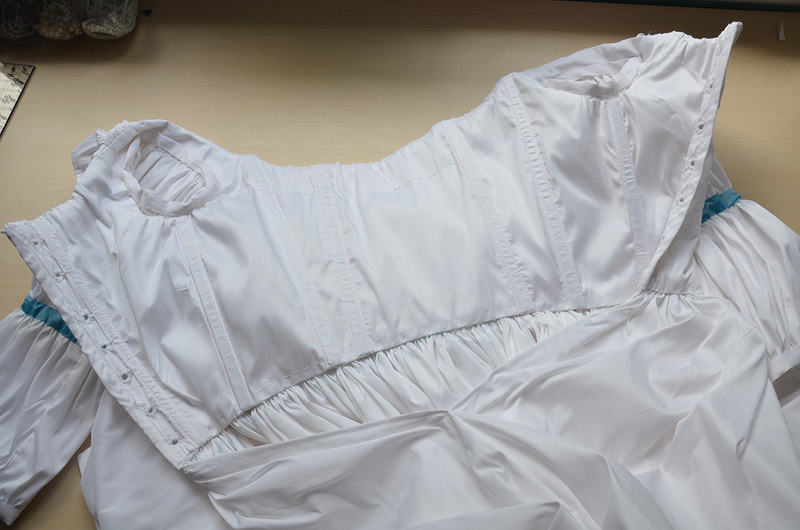 The bodice is made from two layers of polyester shantung, the lower layer serves as a base for the boning and doubles as lining. This is the lower layer, you can tell because all the channels are marked out in colored pencil! 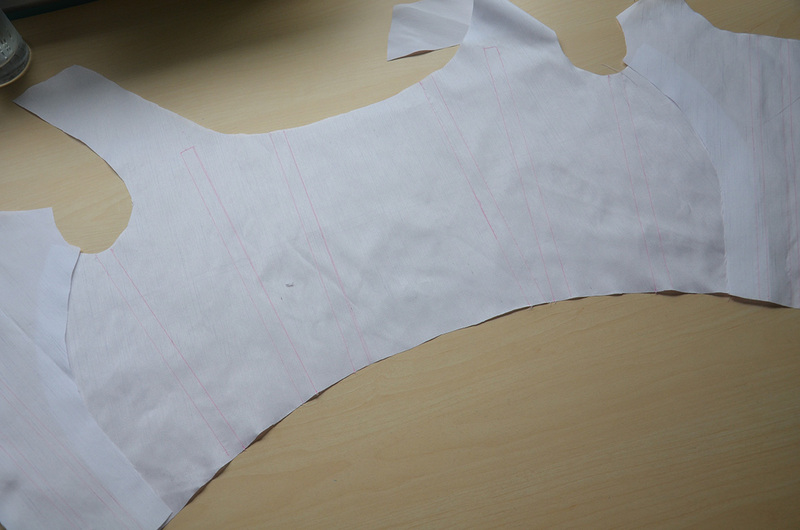 I made the boning channel from bias cut strips of shantung. This was a bad idea. At the time I had forgotten how much shantung puckers. Even after spending half an hour with my iron on the highest setting and a spray bottle of starch I couldn’t get all the puckers out. Such evil fabric. 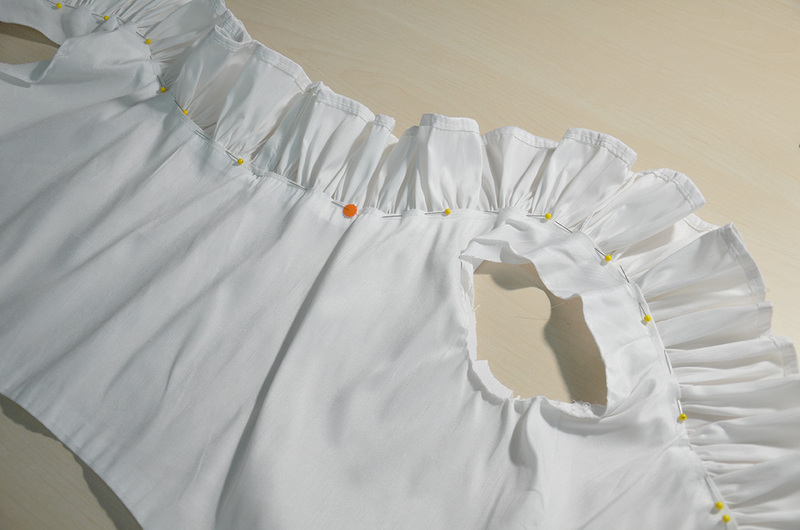 After I was done ironing I sewed the pieces together and pressed the seams open. 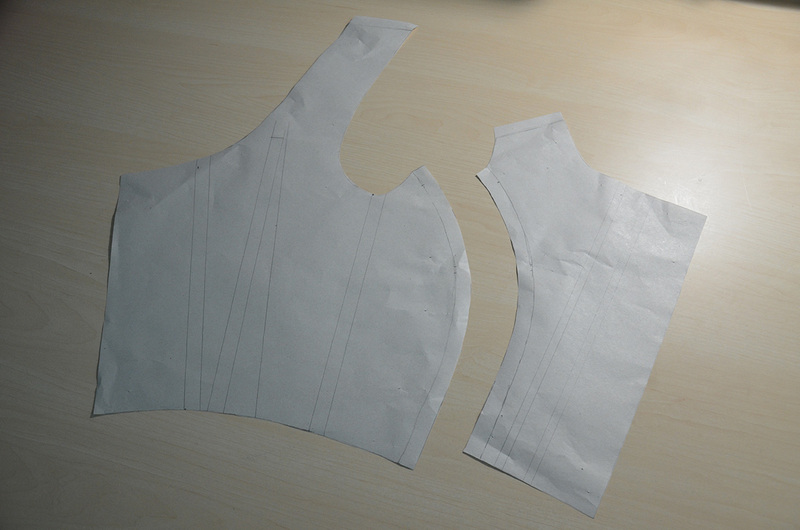 Then I made marks one inch away from the neckline, these serve as a guide for getting an even half inch hem. 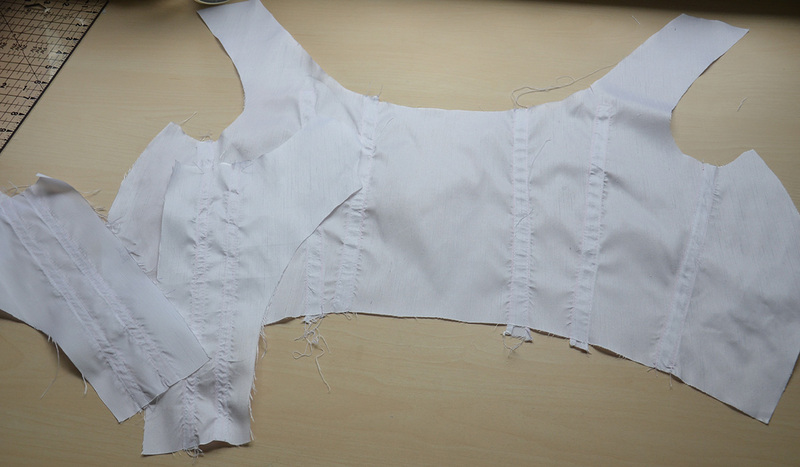 The boning was inserted and each raw edge got pinned in place. I used a large running stitch to sew all the edges down. I repeated this process with the top layer of fabric, but used much smaller stitches to secure the edges. Then I cut long strips of shantung and hemmed one edge – I used my sewing machine to hem this, which is quite the rarity for me these days! 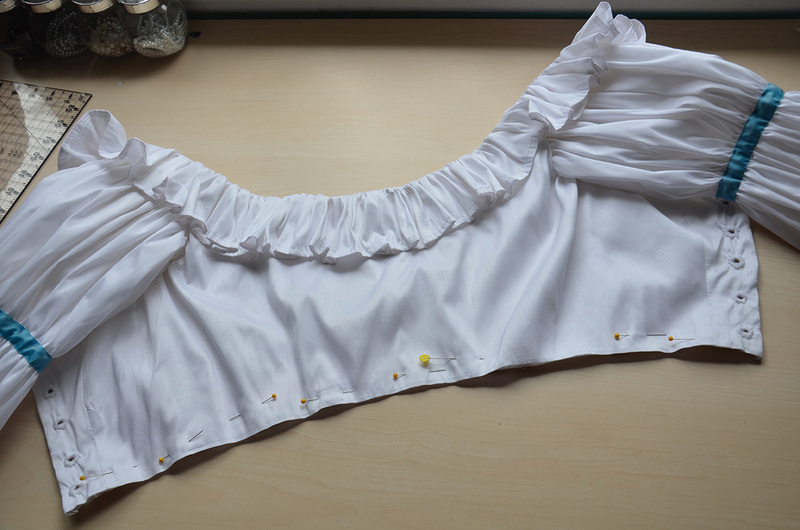 I gathered the top to create a long ruffle which eventually got sewn on to the bodice neckline. 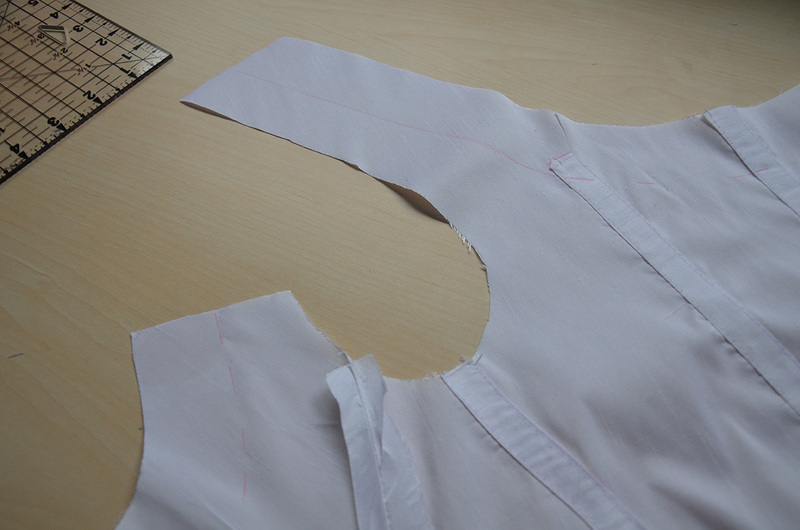 Then the lining was pinned in place. 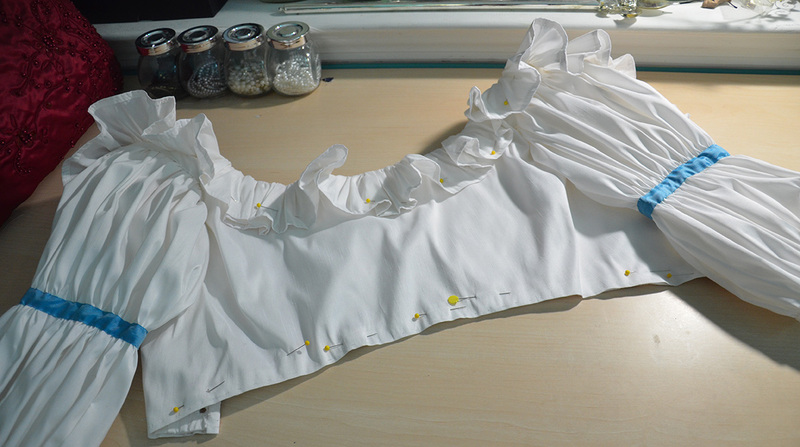 Since I did all the steps in the right order the lining covers the raw edge of the ruffles. I sewed the lining in with small whip stitches but made sure to leave the lower edge open. 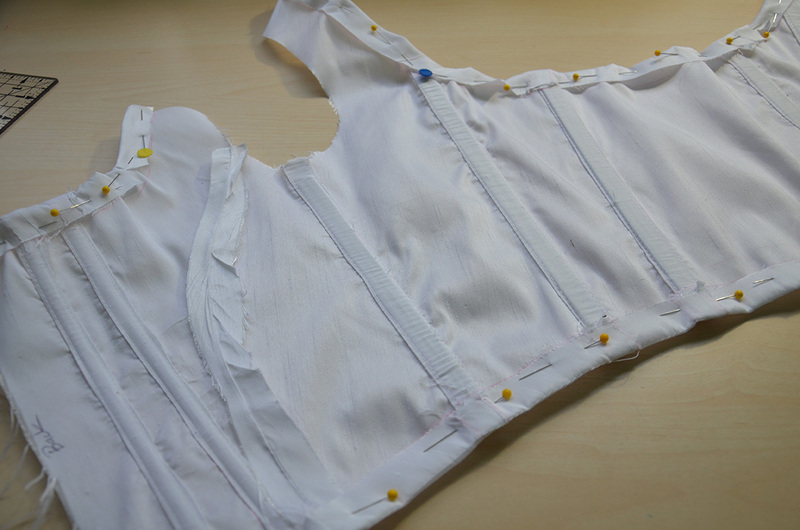 I embroidered eyelets up the back, then attached the sleeves. 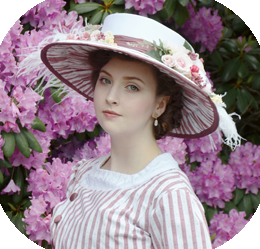 I used my usual method of combining the running stitch and whip stitch together to make sure they are really secure. 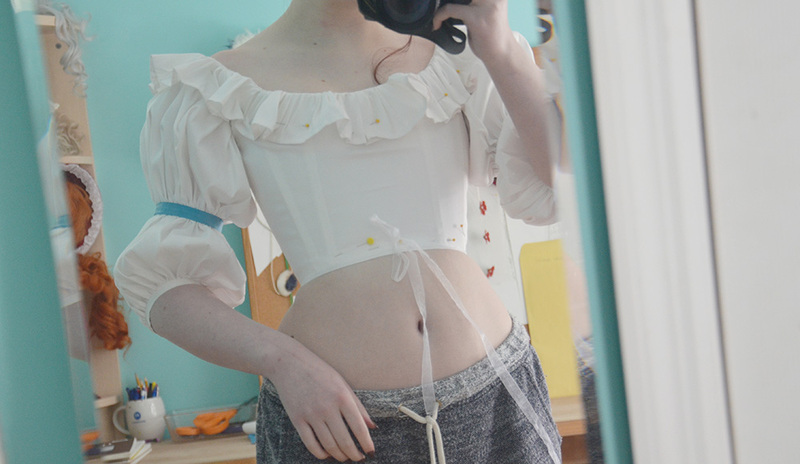 Now that it had sleeves and eyelets I could try it on! At this point I realized the major fit issue, it’s too small at the shoulders and pulls in an uncomfortable way. It doesn’t look that bad, and I can deal with it, but i’m sad I didn’t notice it sooner. 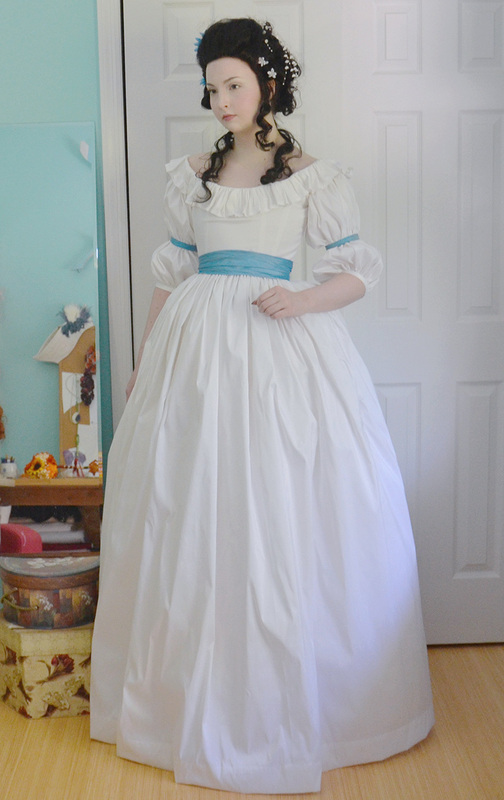 The ruffle on this dress was kind of crazy so I used long stitches to tack it down. Then it was time to add the skirt! I left the bottom of the bodice open intentionally so I could slip the skirt underneath the lining and keep things looking pretty. 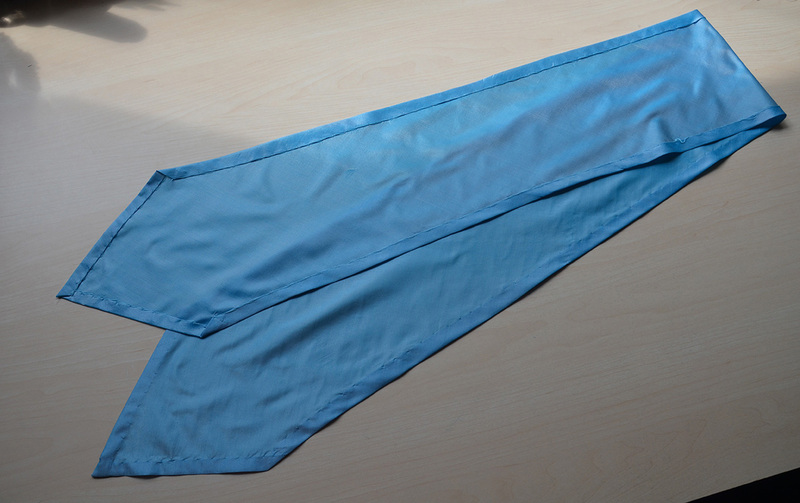 I sewed the skirt to the lining with a running stitch, then whip stitched it to the front and back. It’s hard to explain but the end result looks nice! All the dress needed was a sash! 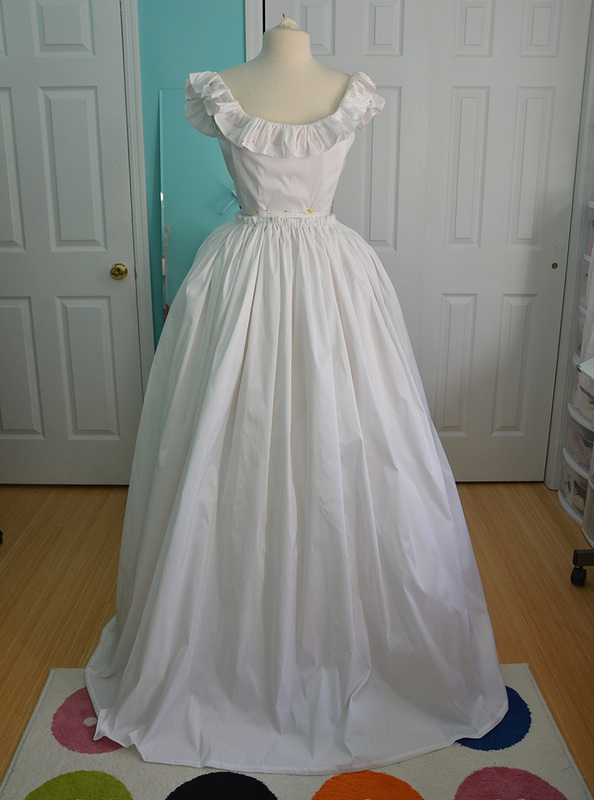 I made this from a bias cut piece of silk taffeta. I did rolled hems on both edges and hand stitched them in place to avoid puckering. 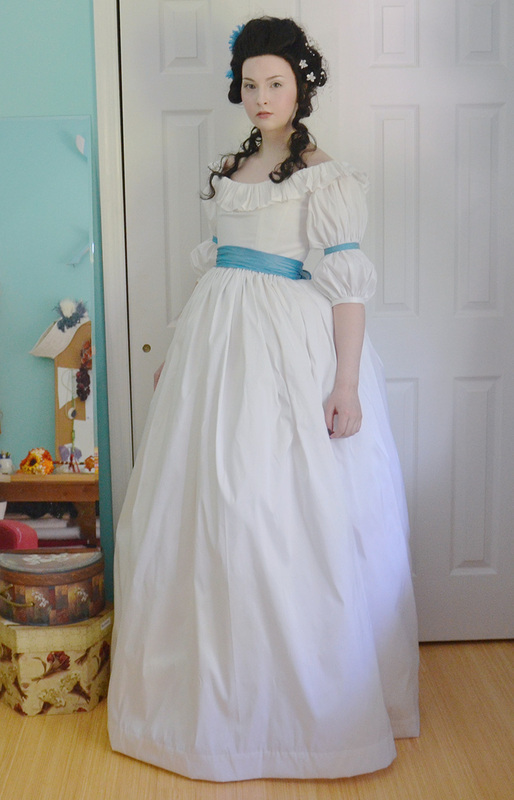 This is the finished dress on my dress form. I really love the shape of this dress, and aside from the problems with the shoulders i’m quite happy with it! 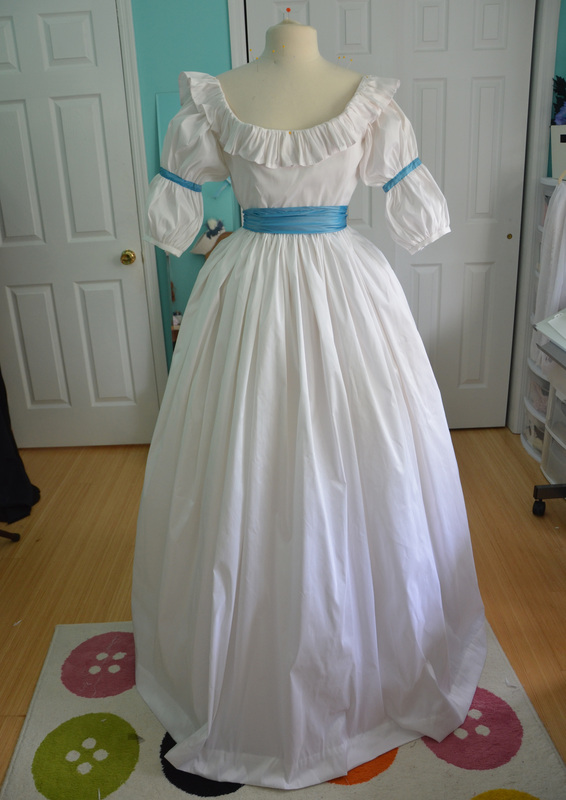 I would still like to make a more accurate version at some point, but this definitely satisfied my urge to make a Chemise a la Reine. I paired it with a black wig. 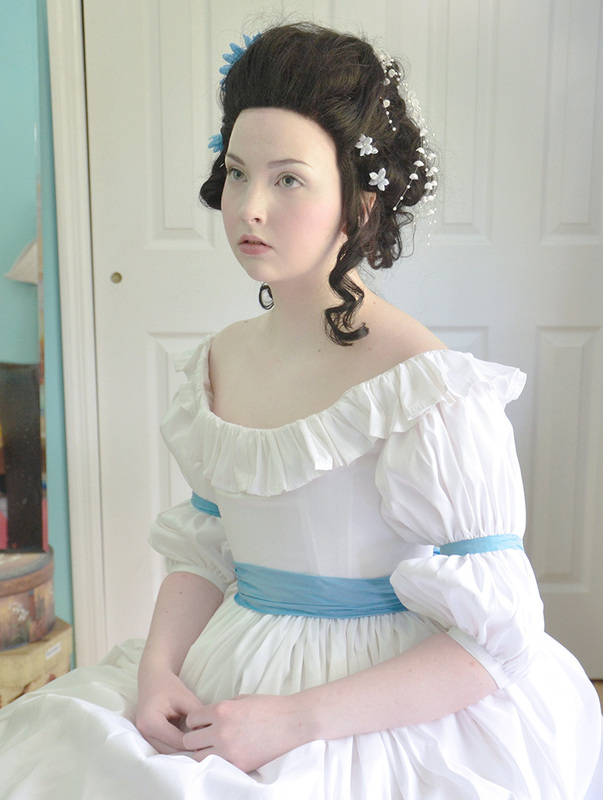 I curled the wig with a 3/4″ curling iron, then recoiled most of the curls and secured them with bobby pins. I teased the front sections until I liked the volume and pinned them in place. I decorated the wig with fake flowers and things since I didn’t have enough fabric leftover for a headpiece. 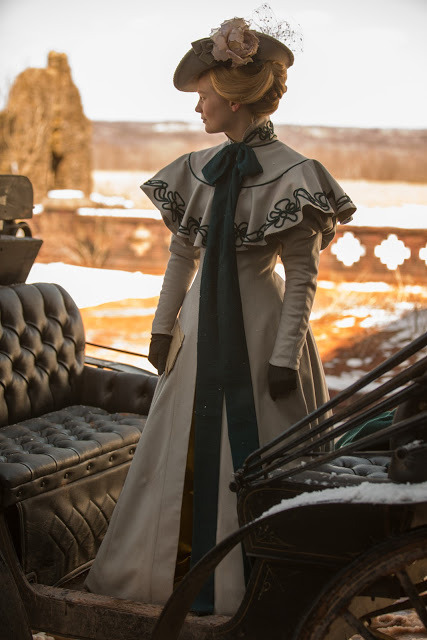 I like the finished ensemble. The colors make me think of snow and wintery things!